A piping plover and chick at Wasaga Beach, where protective measures have led to the nesting of 36 breeding pairs and the fledging of 64 chicks in the last decade. If all goes well, a small endangered shorebird with bright orange legs will soon arrive on Sauble Beach and start to show off. By the end of April, the male piping plover should be flying back and forth in a figure eight, alerting females with loud peep-peeps that the stud they no doubt have been waiting for has arrived. He’ll tussle with competitors to claim territory, scrape out a nest by shovelling sand with his feet and advertise his work with more loud calls. If a female tries out the nest, he will stand above her and spread his wings and tail like a fan, as if gallantly sheltering her from the sun. To seal the deal he’ll puff out his white chest, stretch his black neckband as wide as he can and perform a lightning-fast goosestep like a hyper-cranked windup toy. Mating isn’t assured, of course. But he might be consoled if he knew his efforts unfailingly seduce a different species. 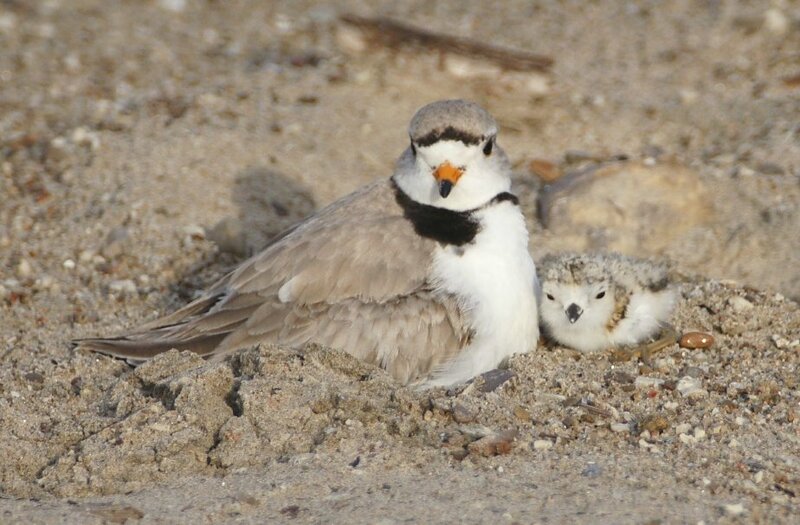 “If everyone had a chance to see the courtship display they’d all be plover lovers,” says Lynne Richardson, a member of a Sauble Beach conservation committee that unofficially calls itself the Plover Lovers. So charmed are these lovers they give the banded birds names: Miss Sunshine has been gamely returning since 2015 despite heartbreaks with chicks and mates killed by predators; Flagboy, last seen in 2017, was an attentive dad and object of much female attention even though at age 4, he was old by plover standards. And yet, it seems beguiling charisma only goes so far. In late May, a trial is scheduled against the Town of South Bruce Peninsula, charged with two separate counts of damaging piping plover habitat with beach work. The birds and their habitat are protected by Ontario’s 2008 Endangered Species Act, and if convicted, the town faces fines of up to $1 million for each count. The trial pits conservation efforts that saw piping plovers return to Ontario’s Great Lakes for the first time in 30 years, against the town’s management of Sauble Beach for sun worshippers who flock there each summer. Mayor Janice Jackson insists her town has protected the birds since 2007, when a pair made a single nest on the Lake Huron beach — the first piping plover nest on Ontario’s side of the Great Lakes since 1977. At the same time, Jackson makes clear she believes the fuss over plovers is much ado about nothing. “We don’t believe that the piping plovers are endangered at all,” she says in an interview, adding she’s counting on Premier Doug Ford’s government to see things her way. Before (top) and after: South Bruce Peninsula Mayor Janice Jackson posted before and after photos of Sauble Beach on Aug. 24, 2017. The raking and vegetation removal threatens the habitat of piping plovers, the province has alleged. To plover lovers and environmentalists, that kind of talk means the stakes could not be higher. The battle, they insist, is not solely about saving a species from extinction in the Great Lakes area. It’s also about saving a habitat adored by both plovers and humans. “The piping plover’s habitat happens to be the beaches we all love,” says Andrea Gress, a Bird Studies Canada official who co-ordinates Ontario’s piping plover conservation efforts in partnership with the Ministry of Natural Resources and Forestry. Sauble Beach has a long history of recreational use. It stretches 11 kilometres, four of which are owned by the town. Bruce County estimates tourists injected $300 million into the peninsula in 2018, and Jackson says most of that was due to Tobermory and Sauble Beach. She puts the number of piping plovers in North America at “millions.” In fact, while the plover family of birds is made up of several species, some with healthy populations, the piping plover is estimated at only 4,000 pairs worldwide, according to the Great Lakes Piping Plover Conservation Team, led by the U.S. Fish and Wildlife Service and made up of two dozen government departments, universities and wildlife agencies on both sides of the border. Historically, piping plovers nested throughout the Great Lakes with an estimated population of up to 800 pairs. Numbers began declining after the Second World War, as Great Lake beaches disappeared under development and tourism. By the mid-1980s, the population had declined to no more than 14 pairs, all nesting in Michigan state. Conservation efforts there, including the rearing of abandoned eggs, were key to raising numbers to 67 pairs in 2018. They nested on the shores of all five Great Lakes, but only eight of those pairs nested on Ontario’s side of the border, including a pair on Hanlan’s Point on the Toronto Islands — the first successful nest on the islands since 1934. Plovers nest on natural beaches, where the sand-coloured birds and their chicks can hide from predators among dunes, scattered vegetation, driftwood and pebbles. Conservation volunteers place large protective cages over the nests with openings wide enough for adult plovers to come and go, but too small for predators like crows, gulls, cats, dogs and foxes. The first 50 metres from the nest — used by plovers to feed and rear their chicks — are roped off and off-limits to human activity, according to government documents that define protected habitat for the plovers under the Endangered Species Act. The next 450 metres of beach is considered “moderately tolerant to alteration.” Beachgoers can use this area as long as they don’t damage the habitat. Beach grooming, grading and removal of vegetation are largely prohibited. Sauble’s first nest appeared in 2007 at the north end of the beach. The town promptly turned that area over to the ministry of natural resources, Jackson says. Beach maintenance stopped and thick willow bushes eventually took over that end, pushing plovers to nest in more open beach areas further south. Poor beach maintenance became an election issue in 2014. Jackson lives 50 metres from the beach and says it’s neglected state was a reason she ran for mayor after sitting as a town councillor since 2010. Her platform included a promise to clean it up and she won with 52 per cent of the vote. She began “tilling and disking,” which is what farmers do to fields with equipment that plows, tears out weeds, breaks up clods and mixes soil. The work resulted in Environmental Defence accusing the town of no longer protecting shorelines and ecosystems. In 2015, the group revoked Sauble’s “blue flag” designation. Jackson says the ministry of natural resources was fine with the town raking the beach until the summer of 2017, when ministry officials complained about work the town had done in April, days before the birds arrived. She says the April work included tilling and disking. Jackson insists no natural dunes were flattened, including the big ones at the back of the beach. But fencing that had captured sand over the years and created dunes were removed. The sand from these dunes was then spread across the beach. “From the years of feedback I’ve received, the majority of people don’t want more dunes, they want more beach!” Jackson wrote in a Facebook post that month. A year later, in late March 2018, the ministry issued a stop-work order against the town after a complaint from Ontario Nature. The order expired at the end of the year. In June and July that year, the ministry laid two charges for “damage” caused to piping plover habitat. The first was for work done in April 2017; the second for work between Aug. 23 and Sept. 7 the same year, when heavy equipment was used to rip out willow bushes that had taken over a kilometre-long stretch at the north end of the beach, Jackson says. Jackson acknowledges the work was done to safely accommodate more beachgoers, but insists it also helped the plovers. “We don’t believe that we have damaged or destroyed plover habitat at all,” says Jackson, who has lived in the town since 1999 and whose family’s roots in South Bruce Peninsula go back to the mid-1800s. “In fact, we maintain that we’ve created habitat for the piping plover. Francie Cuthbert, a leading plover expert, says Jackson is mistaken. “Plovers do not, unless they’re desperate, nest in a ‘clean’ beach that’s been groomed — as in flattened — which is one of the things that was done at Sauble,” says Cuthbert, a wildlife biologist specializing in water birds at the University of Minnesota. So-called clean beaches leaves them vulnerable to predators. Cuthbert’s research since the mid-1980s is credited by the U.S. Fish and Wildlife Service as crucial to conservation plans that saved piping plovers in the Great Lakes. She will be testifying as an expert witness for the prosecution in the Sauble Beach court case. Cuthbert visited Sauble to prepare for the case. She describes the impact of the town’s beach work as “shocking,” and insists some small dunes were flattened. She calls Sauble Beach the most altered coastal ecosystem she’s seen on the Great Lakes. “The whole stretch of Sauble is what I would call a very degraded coastal shoreline,” she says. “It’s been managed for people. It’s been managed for a very long time without recognition of the importance of biodiversity. The return of plovers to Sauble doesn’t mean they like the town’s beach work, Cuthbert insists. The birds tend to return where they nested successfully, and a growing population means more are searching for habitat throughout the Great Lakes. To illustrate her point, Cuthbert compares the breeding success of plovers at Sauble with that at Wasaga Beach, where she says beach maintenance is less disruptive and the birds more widely embraced. From 2007 to 2018, a total of 34 breeding pairs nested on Sauble Beach. They produced 35 chicks that “fledged,” which means they flew at least 50 metres non-stop. That happens within 23 to 28 days of hatching, if they survive. Fledged chicks will stay on the beach for several more weeks, gaining strength before migrating. Wasaga Beach, on Georgian Bay, has a significantly better record. The first breeding plovers nested in 2008. By 2018, a total of 36 breeding pairs had nested and 64 chicks fledged. Last year both Wasaga and Sauble had three nesting pairs of plovers. Nine chicks fledged at Wasaga, two at Sauble. Cuthbert says Sauble’s “clean,” flattened beach leaves piping plovers more vulnerable to predators. Recently, Jackson was in Toronto to negotiate a beach management plan with the ministry of the environment. She says talks for such a plan have gone far better since the ministry of natural resources is no longer responsible for administering the Endangered Species Act. She expects the plan to be finalized within a month. In the meantime, the defiant mayor is planning on winning at trial.